Simon speaks at conferences and seminars, sharing insights and inspiring audiences on the future of work and leadership. Simon is an expert in leading in a rapidly changing world and he brings these topics to life as a charismatic, impactful, thought-provoking speaker. As keynote presenter at a conference, contributor at a seminar or team function or after dinner speaker, Simon can put into context any aspect of the leadership/future/people/technology/performance cocktail. He leaves audiences enlightened, informed and in a position to ask searching questions about whether their own situation or organisation is fit for the future. He draws from his broad experience of many sectors, more than a decade of research, case studies and first-hand leadership experience to make any speaking event relevant to a his audience whatever the angle. More than just understanding Generation Y – how to engage, empower and inspire all generations. Why the world of work is changing, what impact this has on organisations and how smart leaders need to respond. Leadership in a world disrupted and transformed by the impact of technology, globalisation and social change. The key trends, such as artificial intelligence, HR analytics and the gig economy, impacting HR and how it should evolve. Thanks so much for presenting at Citi Simon – the feedback received was excellent. Some of the comments included “Really useful when thinking of the future generation and how to engage and recruit”, “An eye opener!” and “I enjoyed it thoroughly! Informative and enjoyable event combining wit, fact and experience of life. It was valuable session for generations of staff. This is one of the best presentations I have attended, the message was very clear and well delivered. Simon provided our team with thought provoking insights which helped us to gain a greater perspective and understanding of the changing world of work. These insights have since provoked a deeper level of discussion between us around the external factors impacting the decisions we make as a management team. 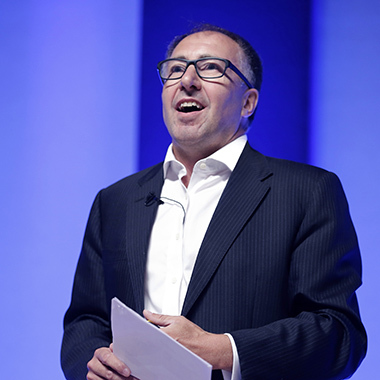 Simon spoke at our recent European HR Conference about the future of work and leadership. It was a great session and provided a challenging overview of the changes that will affect our businesses and their HR strategies. Looking for future leadership insight and inspiration at your conference or event?